In the midst of holiday business and stress, getting the Christmas tree, decorating the house, shopping for gifts, trying to survive the end of the year, etc., I would guess that many of us may find ourselves wondering what this is really all about. What is it all for? What exactly is it that we are celebrating? On the one hand, if we’re being honest I think we must acknowledge that among other things, as a society, we are perhaps first and foremost celebrating American capitalism and consumerism, the mere spending and making of money. To be fair, and on a significantly deeper level, certainly many of us are celebrating meaningful relationships with loved ones, our family and friends, possibly even reaching out to strangers through acts of service and charity. My sense is that on a broader, cultural level, this may not mean much more than a vague and generic sentimentality that is then reduced to a proscribed “niceness” and strained civility. This is the time of year when we are supposed to be nicer to one another, when we should be able to show greater tolerance toward each other, or at least not be outwardly rude and mean in our mutual interactions. However, I believe that we can do better than this as Americans, and that ultimately the true meaning of Christmas is to be found in a radical empathy and commitment to actively-engaged caring. It is a foregone conclusion that in our contemporary society and culture Christmas has become a mostly secular holiday whose original religious roots have been obscured and are, at least practically speaking, often forgotten. A fuller and revitalized meaning for Christmas is not possible without a proper understanding of its religious and spiritual foundation. 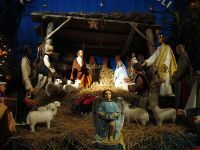 Historically, Christmas has been, and theoretically still is, a celebration of the birth of Christ, God becoming a human being in the form of baby Jesus lying in the manger. The cause of the extensive secularization of Christmas as a national holiday is certainly no mystery; while millions of Americans appear to identify themselves as Christians and adhere to an exclusively literal, traditional interpretation of the Christmas story, there are also millions of Americans who do not identify themselves as Christians and do not accept such an interpretation, or perhaps recognize any legitimate religious basis at all for the holiday. Given that within our Western culture since the time of the Enlightenment traditional, conventional religious views, and those of Christianity in particular, have ceased to hold a prominently influential status, it isn’t difficult to see why the meaning of Christmas has become so problematic. I have stated in previous blog posts that an acceptance of and identification with traditional Christianity isn’t necessary for a meaningful experience of Christian-based holidays, and I will affirm once again that a merely intellectual and formal adherence to literalistic Christian doctrine and dogma is not only unnecessary, but may actually inhibit, an authentic experience of them. Therefore, a narrowly limiting and overly literalistic interpretation of the Christian doctrine of the Incarnation (an abstracted creedal formulation of Jesus Christ as the second person of the Trinity, fully God and fully man, born of a virgin, etc.) should not be an obstacle to a genuinely empowering encounter of the Christ child in your life. In opposition to this unfortunately still reigning interpretation, I would like to offer a more inclusive, dynamic, and experientially-based interpretation of the Incarnation that places it within a much needed existential context. In light of our human predicament and under the conditions of existence, we are estranged and separated from our own beings, the beings of others, and Being-itself (Tillich, 1957). We are isolated, finite beings, imprisoned within our own limited experiential frameworks, value perspectives, and meaning systems. We long to be understood and valued, for our experiences to be validated and affirmed, to know that we are cared for and not ultimately alone in the universe. What we most desperately need is empathic connection and encounter, which I would suggest is the true meaning of the Christmas event, the birth of the Christ child within our midst. If we view empathy as understanding and sharing in another person’s experience, as the popular expression puts it, to “walk a mile in another’s shoes,” then I think we are completely justified interpreting the Incarnation in terms of empathy, for that is precisely what it means. As the prologue to the gospel of John states, “The Logos (originating principle of reality, Existence/Being-itself) became flesh and dwelt among us;” The Infinite God became human and shared in our finite humanity so that we finite beings can become infinite and divine. In the finite person of the baby Jesus the Infinite has entered and supportively experiences our existential predicament with us, empowering us to overcome it…Emmanuel, meaning “God with us.” We are not alone in our pain and suffering, or our joy and happiness, or within any of our experiences; we are understood and cared for, valued and affirmed, loved and supported in the midst of all our life experiences. Through experiencing this healing, empathic connection in our relationship with the ultimate Ground of our own beings, we are able to experience it in our relationships with the beings of others. In light of global, social, and interpersonal destructive conflict and violence, which ironically and tragically surround our hollow platitudes of “peace on earth and good will,” I believe it is clear that this is what the human race most urgently needs. For when we empathize with other people, genuinely trying to understand their belief/value perspectives and respecting their rights to hold them, actively sharing in their experiences and providing real care/support, we can no longer see and respond to them as absolute “others,” completely unlike and alien to us, or as objects to be used and manipulated for our own purposes. Empathic connection brings us together and reveals our shared nature and existential condition, reminding us that we are interconnected fellow members and brothers/sisters of one human family, which in turn heals chasms of inflicted brokenness, reconciling divisive splits and restoring our essential unity. The reality of Christmas can be meaningfully celebrated by each one of us if we are willing to receive the gift of empathy through the birth of the Christ Child in our lives. Tillich, P. (1957). Systematic theology volume II: Existence and the Christ. Chicago, IL: The University of Chicago Press.